The client’s residence had a huge completely enclosed shower with marble tiles and built-in benches. The tile although unique and beautiful, had too many deep veins, pockets, and fissures which supported this heavy mold growth. This type of finish is best used for ornamental purposes, not for foot traffic or wet use such as showers or pools due to its porous nature and difficulty to keep clean. 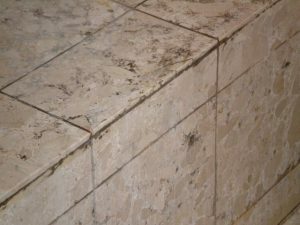 Smooth polished surfaces that are not porous are suggested for use in showers so that soap, skin, hair, and water don’t get trapped and hold all the ingredients for mold growth. You would need to pressure wash the tiles and apply a biocide after every time you shower, and use a dehumidifier to quickly dry it out. Too much maintenance for me. September 2017 Project.